Montpelier became an incorporated village in 1874 and held its first municipal election in April 1875. The village council initially met in James Allen’s drug store on West Main Street. The Village later purchased an old one-story wooden frame schoolhouse and moved it to the public square for use as a town hall. The structure’s east side served as council chambers and its west side was converted into a town “calaboose” or jail. 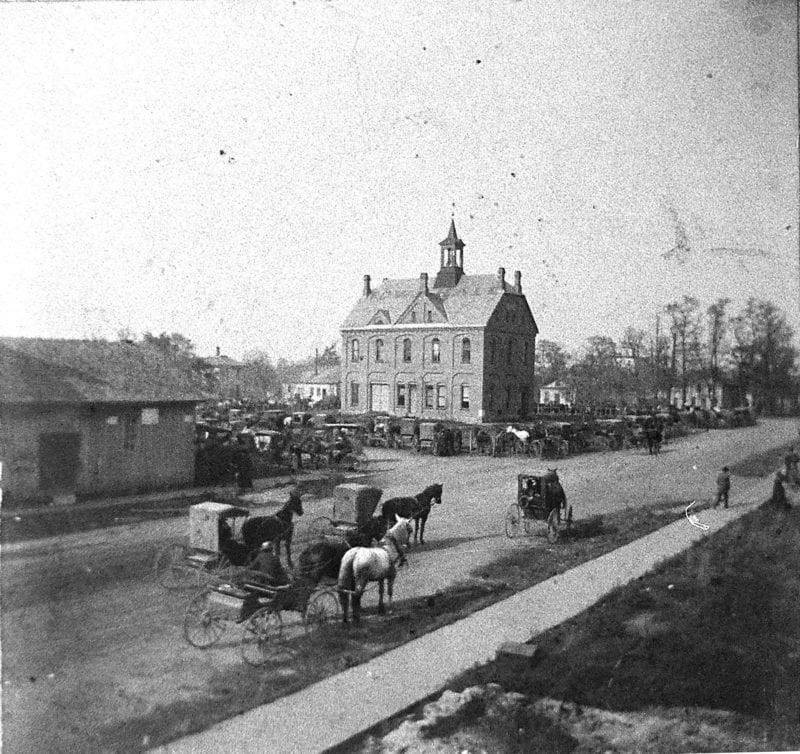 In April 1892 Montpelier citizens approved construction of this brick town hall jointly with Superior Township. Sam Martin was awarded the contract at a cost of $4,190.85, and the building was first occupied in January 1893. A fire bell was placed in the cupola that failed to meet the approval of the local newspaper editor, who wrote in February 1893, “Our pot metal fire bell ought to be taken down from its lofty eminence and run into sled runners or into the ground—it matters not much which. Ever since it was hung we have been trying to discover its pitch of tone and have concluded it must be P, for you know that in music P stands for soft, and it also stands for ‘phizzle.’ Take it down for it is a disgrace to the family of sweet toned bells which now grace our beautiful city.” An addition was built on the town hall’s west side circa 1947 to house the Montpelier Fire Department. This vintage image of the Montpelier village hall is from the 1978 History of Williams County published by the Williams County Historical Society–Courtesy of the Williams County, Ohio, Local History Exchange. Be the first to comment on "(1874) – Montpelier Becomes Incorporated Village (Montpelier, Ohio)"